Playa Chiquita is located southeast of Puerto Viejo, Limón; this is a small Caribbean town with exotic and beautiful beaches, these are far from the hustle and bustle of the city, here you will find the tranquility and privacy that you are looking for during your vacation. This beach is located approximately 4 hours from San José, the capital of Costa Rica, you can reach this area in shared service, this shuttle service takes you from hotel to hotel in small units, without having to drive through unknown places or have to move to a bus terminal; this service can be booked with Interbus. 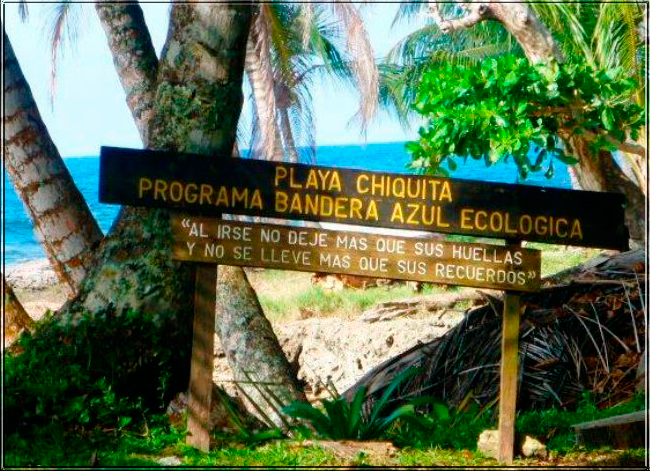 You can also travel to Chiquita beach by public bus or rent a car. Once on this beach you can travel by bike, which is very common in the area. In Chiquita beach, you can find a variety of hotels, while being very close to Puerto Viejo, Cocles and other beaches, you can visit several areas during your stay. At Chiquita beach, you can explore beautiful coral reefs in its crystalline waters, it is important to stay within the areas designated for swimming, as this beach has some areas that are difficult for swimming. In addition, if you wish you can just relax on its white sand beaches or enjoy its lush jungle. This beach is excellent for hiking. Its scenic beauty makes it perfect for a walk or a stroll along the beach, here you can enjoy dolphin watching tours, surfing, horseback riding, canopy tours and ATV tours in the jungle. You can also visit many attractions near this area such as the Gandoca - Manzanillo Wildlife Refuge, Punta Uva Beach or other Caribbean areas.